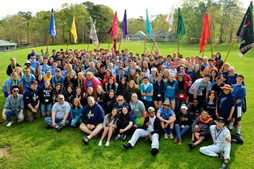 Rotary Youth Leadership Award: The District 7950 RYLA program is a life-changing leadership camp for tomorrow's leaders to gain hands-on experience in developing leadership skills with a focus on community service. This is an amazing opportunity for young leaders to come together with others from all over Massachusetts and Rhode Island to work on leadership skills and have fun. The conference is held each May in Brewster on Cape Cod beginning on Friday and ending on a Sunday. It is open to high school sophomore and juniors with lasting opportunities for RYLA Alumni to step forward and work with Rotarians and other organizations to put their leadership skills into action through coordination of leadership seminars and community projects throughout the year. The Rotary Club of Sharon typically offers up to 4 scholarships for the conference which takes place on a weekend in mid-May. Applications are due by the 4th Friday in March! For more information click HERE.